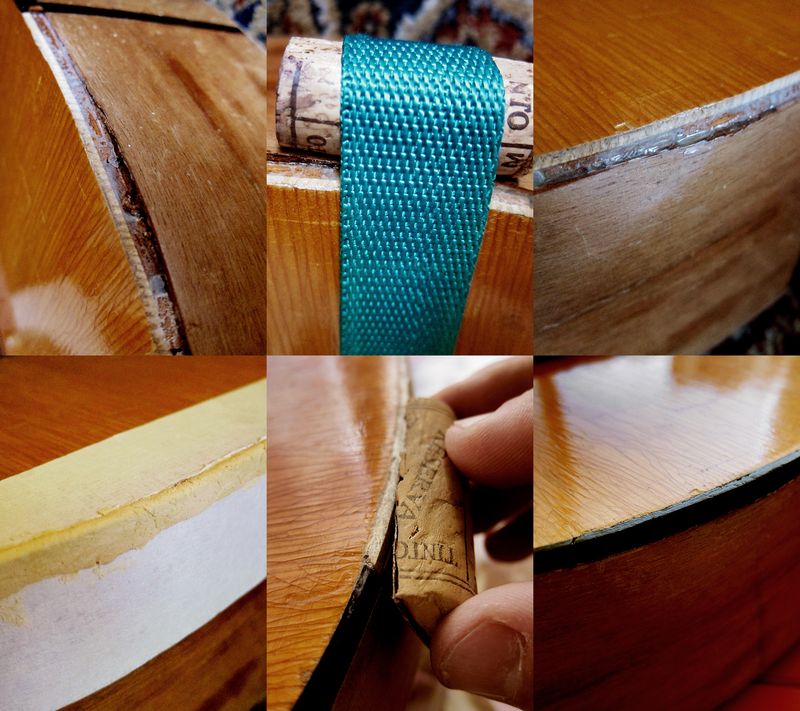 The 1960’s Juan Estruch Barcelona guitar before and after I cleaned it up. 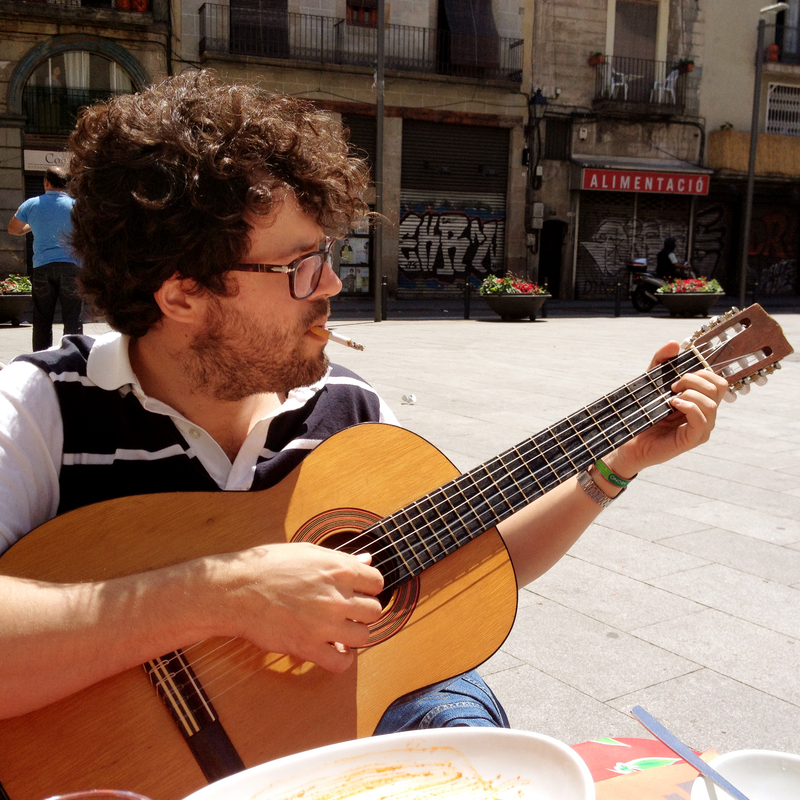 I recently bought an old Juan Estruch guitar for my friend Rafa. He has mentioned numerous times, actually since the day that I found my Francisca Montserrat, that he would love to have an old Spanish guitar. So for his birthday Araceli and I went to all the Cash converters we could think of an eventually found a beat up Juan Estruch for him. The brand was founded here in Barcelona by Juan Estruch Rosell in 1880. This guitar seems to have been made between 1960-1969, according to the label, and has a solid top. There was a few things that needed to be sorted to get it playable but I could tell straight away, even with strings missing, that it had a nice tone and great projection. Here is some info about the brand taken from Wikipedia, unfortunately in Spanish for you English readers: Guitarras Juan Estruch es una marca de guitarras y otros instrumentos musicales de Barcelona. 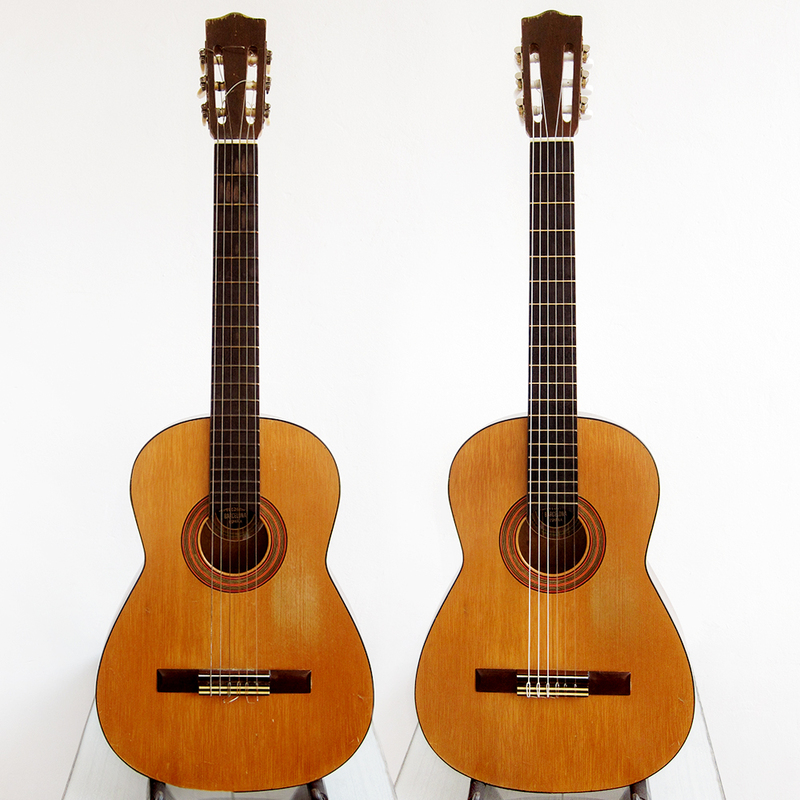 La compañía fue fundada por Juan Estruch Rosell en 1880, siendo maestro de otros luthiers de fama como Enrique Sanfeliu1 de quien exponen una guitarra en el ministerio de educación de Uruguay. 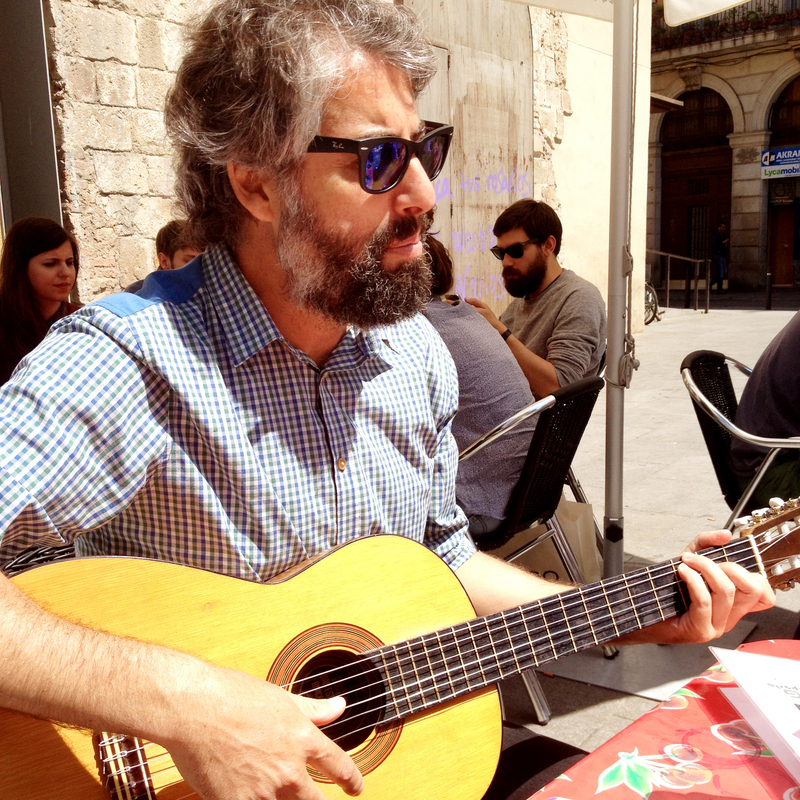 Después de la guerra civil, su hijo Joan Estruch Sastre se hizo cargo del taller de la calle Ample continuando con la construcción artesanal de guitarras siguiendo la tradición familiar. A su muerte (1970), su hijo Joan Estruch Pipó, se hizo cargo de la empresa hasta su muerte en 1989. Hoy en día la empresa sigue en Rubí, con el nombre ESTRUCH Luthiers , a cargo de la viuda y el antiguo encargado del taller Rafael Montes que entró a los 14 años, aunque la mayor parte de su producción es para la exportación. En los años sesenta muchos de los cantautores de la nueva canción catalana fueron clientes del taller de la calle Ample haciendo un lugar de encuentro con animadas tertulias. I wasn’t really sure how to fix the missing binding. In the end I decided to do a MacGyver and just use what every I could find at home. First I closed the gap between the side and top with fish glue and then I filled it up with wood filler. When it was dry I sanded it in to shape, got it smooth and then painted it black to match the original plastic binding. You did a great thing giving that old guitar new life with your friend. I’m glad I could help. Yeah, I love to give guitars a second chance and bring them back to life. I’m not so good at the value of old nylon stringed guitars.